You can select any layer from the Stage view, Layers panel, or Thumbnails view. Selected layers turn blue. Stage view and Layers panel: Click the layer you want to select. 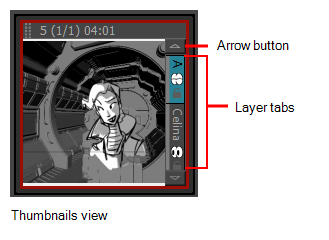 Thumbnails view: Click the layer tab of the layer you want to select. Arrows above and below the layer tabs indicate additional layers. To select multiple layers, press Ctrl (Windows) or ⌘ (macOS) and click each layer you want to select. Also, press Shift and click one layer and then another to select a sequence of layers. Layer > Select Next Layer to select the next layer up the layer stack, stopping at the top of the stack. Layer > Select Previous Layer to select the next layer down the layer stack, stopping at the bottom of the stack.